We had a great time, loved the view. the kitchen was one of the best stocked we have ever had. We enjoyed our Thanksgiving stay! We enjoyed our stay very much! Cabin was so clean which made me feel right at home!! the ladies at GSCR were very courteous and helpful! This has been a girls vacation week and being here at the cabin has been a peaceful and rejuvenating Time. After the train ride, the rains came but what a pleasure it was to come back to the cabin to relax and listen to the rain. The cabin was beautiful, roomy and clean. We wanted something other than a VRBO so that we had a bit more security if something was wrong. We were much happier away from all the touristy hoopla, so we were well pleased with Bryson City. Our family really enjoyed everything. Thank you so much for allowing us to stay here. We appreciated your home and really enjoyed the waterfalls. The cabin was great, we loved it! It was more than we expected. Would definitely like to visit again soon. The kids loved the drive up the mountain to the cabin, they didn't know whether to be scared or excited. We had a great experience, the information and directions were excellent. We liked the location and privacy of the area. My husband and I loved the house and its features including the spa bathtub. The view from the porch was beautiful. We chose to go hiking and another side trip from the welcome book that was provided and had a great time outdoors. The Wolf Ridge cabin was very clean and accommodating. We loved the location on a mountain side with the right amount of seclusion. We loved the view of the mountains out of the large window in the front of the cabin. 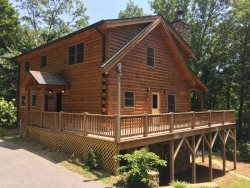 The Wolf Ridge cabin was located were we wanted to be and the rates were affordable. This beautiful cabin was very clean and extremely comfortable. The location was great for our family vacation. This cozy cabin was a perfect place for us to celebrate the New Year together. Everything was perfect and the view took our breath away every morning. We will be back! Beautiful cabin with a wonderful view. We definitely enjoyed our stay here and would love to come back and bring our kids. Thanks for providing such a wonderful experience! Had a wonderful time! Nice place. Exceeded expectations. Very clean cabin, comfortable beds, and superb communications. Highly recommended. We enjoyed staying at your lovely cabin! We had a great time white water rafting and enjoying the peaceful surroundings. The cabin was perfect for our family of 4. We hope to return again. This was a great get-a-way from the hustle and bustle of South FL. We spent our first day in Bryson City on the train and eating out. The next day we drove to the National Park, hiked and drove to Gatlinburg, TN. The cabin was beautiful with a perfect view. Don't forget to include gem mining. Our 4 year old loved finding his treasure. The pictures on the website didn't do the cabin justice! Beautiful cabin far exceeded my expectations!!! Easy to work with; responded quickly to inquiries and kept in contact via email before our arrival and on the day of arrival. Beautiful cabin in a great location. We will be back.